Not all the walls are straight, and even if they are, not all the furniture inside needs to adjust its shapes to them. Sometimes what a room interior design needs is a different angle, mix the square and rectangular shapes with some organic and original elements to make unique your interiors. The curved furniture has always been an option in the market, with baroque shapes or clean lines although not all the designs survive well the pass of the time, others are eternal pieces. Rounded shapes evoke emotions of relaxation, bring a natural element to your rooms, promote movement, circulation, and activity. This is a selection of voluptuous furniture, a mix of shapes, materials, colors, and textures. Sometimes sophisticated, others neat and uncomplicated, but, we can agree, all of them remarkable. It’s easy to make a design statement with these curved chairs, of course, the colors on upholstery and finishes will make them pop in any room. These are Cila Go by Lievore Altherr for Arper, unifying design and function and Mini Papilio, inspired in a butterfly by Naoto Fukasawa for B&B Italia. A sofa is a perfect piece to play with curvy shapes. You can look at them and see when the designers had fun creating. Victoria & Albert, the iconic sofa designed for Ron Arad for Moroso in 2000 and The Ploum sofa designed by R.&E. Bouroullec for Ligne Roset. These dining tables are not average, and we love them. Tobi-Ishi, Edward Barber & Jay Osgerby first project for B&B Italia and No Waste designed by Ron Arad for Moroso. 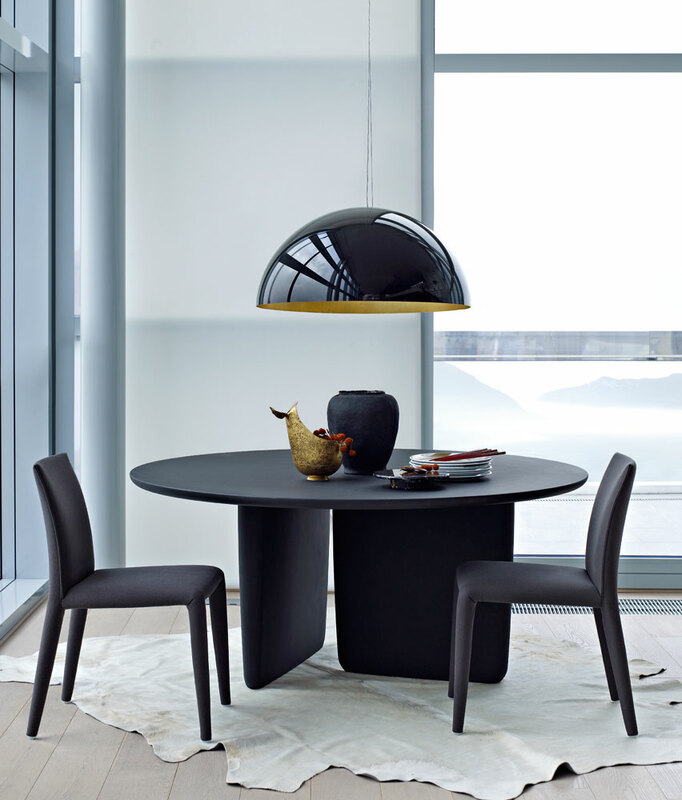 The Serie Up 2000 designed by Gaetano Pesce for B&B Italia recalls the shapes of a woman. Juju by Edward Van Vliet for Moroso combines damask embroidery, oriental symbolism, floral patterns, and digital grids. Bookshelves with curved shapes that give to your walls an extra dimension. Bookworm by Ron Arad for Kartell and Cloud by Ronan and Erwan Bouroullec for Cappellini. Mirrors or art pieces? Miraggio, formed by the manual assembly of cutouts of different shapes in colorful acrylic mirror, design by Fernando e Humberto Campana for Edra. On the left picture Pop, with a frame made of glass fused to a flat mirror, Marcel Wander design for Fiam.